KIDS ON COURT… Numurkah Lawn Tennis Club members Kynan Bethell, Pim Hipwell, Lochie O’Brien, Eamon Storer, Billy Smith, Teddy Smith, Jarred Bethell, Jobe Garner, Rahni Garner, Hudson Storer, Hannah O’Brien, Jo Griffie, Arthur Smith, Pippa Stammers, Darcy Carmody, Addi Stuart, Dylan Alcot, Myla Stuart, Mercia Griffie, Pippa O’Brien, Seb Garner, Alice Trimble, Aleece Bethell, Griff Griffie, Sienna Newell, Addison Newell and Remi Storer on the court with tennis star, Dylan Alcott. Photo: Supplied. 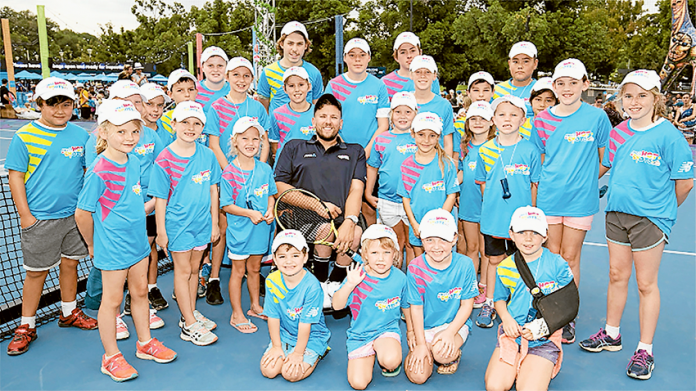 MORE than 100 local budding tennis stars and their families from Numurkah Lawn Tennis Club and Ky Valley Tennis Club had the chance to take to the courts at the Australian Open as part of this year’s ANZ Tennis Hot Shots Community Play program. Fifty Numurkah Lawn Tennis Club ageing between five and six and their parents took to the courts. In total 65 from the Ky Valley Tennis Club took part in the first day of tennis action, with a further 10 children getting the chance to play on court five on the second day. Numurkah Lawn Tennis Club coach, Mark Mills said, “It was a great experience and the kids had a photo with tennis star, Dylan Alcott on the tennis courts. 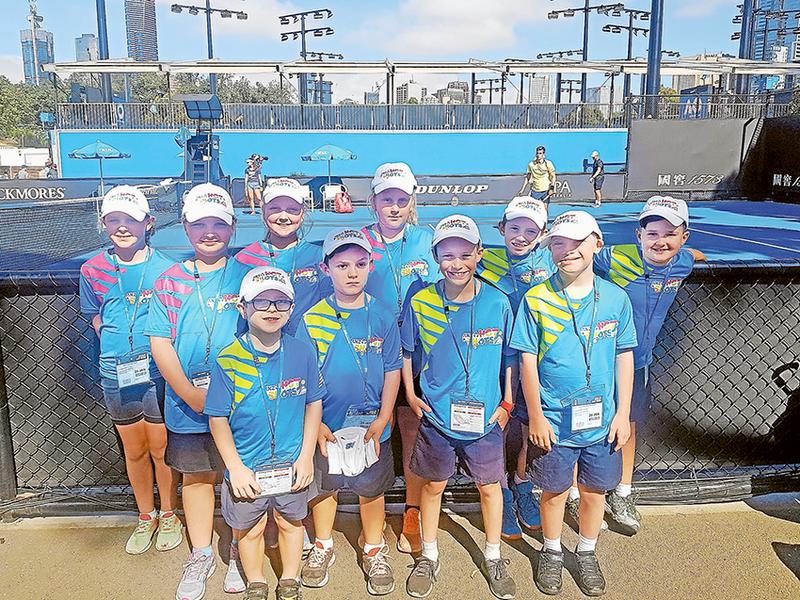 Ky Valley Tennis Club Hot Shots coordinator, Melissa Williams said, “We were back at the Australian Open on day seven (Sunday, January 20) for the ‘Kids on Court’ experience. Our children drew court five and played prior to the first round match of the Junior Boys Singles against Harry Wendelken (United Kingdom) and Gauthier Onclin (Belgium). Wendelken won 7-5, 6-7, 7-6. “Our own Taylor Horder had the honour of doing the coin toss for the match. 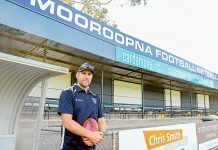 “Max Hausler, Couper Williams, Will Penn, James Penn, Tayla Horder, Amelia Palmer, Olivia Gemmill, Amity Wright, Jack Forde, Nash Eddy were the 10 lucky children selected to participate. 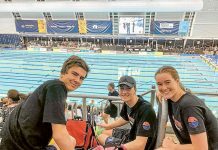 AN EXPERIENCE LIKE NO OTHER… From left (back), Ky Valley Tennis Club members, Tayla Horder, Amelia Palmer, Olivia Gemmill, Amity Wright, Jack Forde and Nash Eddy. (Front), Front-Max Hausler, Couper Williams, Will Penn and James Penn. Photo: Supplied.